Socialists Unify in Barcelona – International Summer School A Massive Success! 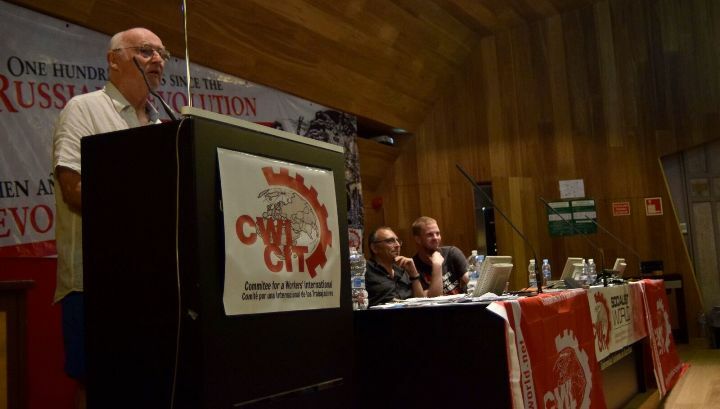 In July, over 400 revolutionary socialists from 31 countries attended a week-long Committee for a Workers International (CWI) summer school immediately followed by the historic unification conference of the CWI and Izquierda Revolucionaria (IR). This international joining of forces and cooperation strengthens the worldwide struggle for socialism and working-class movements and was greeted with great excitement. The school opened with a plenary discussion on the situation in Europe which introduced themes that were central to all discussions during the week. These included the unresolved and structural nature of capitalism’s ongoing crisis, the rise of new mass left formations in a number of key countries, as well as the importance of principled socialist leadership both in the struggle in communities and workplaces against austerity and in offering a Marxist alternative to reformist leaderships in mass movements of workers and youth. The school heard examples of how the CWI and IR in Britain, Spain, Germany, Brazil, France and elsewhere, approached the mass movements around new left parties and leaders, from Jeremy Corbyn to PSOL (Party of Socialism and Liberty – Brazil). Our unique approach – of positive engagement to build these movements into powerful mass parties of the working class, combined with an honest criticism of the limits of reformism and defence of a socialist, internationalist program – has allowed our forces to become increasingly significant factors within and around these developments. Comrades from South Africa, Greece, and other countries explained how, even in the absence of such mass forces at this stage, Marxists can play a leading role in attempts to gather the forces from the ranks of the movement for the building of mass political alternatives which can undergo rapid growth and development. The school took place in the immediate aftermath of the acquittal of the Jobstown defendants in Ireland, including Paul Murphy and two other Socialist Party (CWI in Ireland) members. This campaign, in which the CWI mobilized support internationally, pushed back the attempt of the Irish capitalists to criminalize protest. This marked the latest phase in the mass struggle against the water charges in Ireland which were an austerity measure imposed by the European Union, European Central Bank and IMF. The Socialist Party helped lead the mass boycott that led to the charges being scrapped. This victory underlines the importance of steadfast principled socialist leadership for the waging of successful class battles. Just before the school, Minneapolis became the latest major city in the U.S. to win $15, spearheaded by Socialist Alternative, including Ginger Jentzen, SA member running for City Council this November. Along with our Irish comrades’ example, Socialist Alternative in the U.S. shows how to use elected positions in capitalist institutions: not to subordinate or sell out the struggle on the streets and in workplaces, but to magnify and strengthen struggles. Compare these victories and principled mass struggles with the shameful policy of demobilization and class collaboration implemented by the majority of the world’s major trade union leaders. The energy, confidence and enthusiasm which has reverberated throughout the ranks of the CWI as a result of these victories, and of the historic unification of our forces with Izquierda Revolucionaria in Spain, Mexico, and Venezuela, set the tone for this unforgettable school. During the course of the school, which took place outside Barcelona, the CWI and IR took the bold initiative of holding a public rally in the center of Barcelona to celebrate the centenary of the 1917 Russian October socialist revolution. Over 600 people attended the event in the searing July heat to hear Ana Garcia, Paul Murphy, Juan Ignacio Ramos, Peter Taaffe, and Kshama Sawant. A separate report of the rally can be seen here. The participation of comrades from IR enriched the course of the whole school, with key contributions on Europe, the national question, trade union and youth work, and the rise of new left formations, among many others. The special unification congress on the last day of the school was organized with delegates elected from the democratic bodies of the CWI and IR national sections. The congress voted on a document outlining the political basis for the unification, and elected leading members of IR onto the CWI’s International Executive Committee. The unification congress was opened and closed by Peter Taaffe and Juan Ignacio Ramos, leading members from the two organizations. Comrades young and old, from Spain, Mexico, Venezuela, Britain, Germany, Greece, Belgium, and the U.S. spoke in a joyful but serious meeting. This congress was not one of sentimentality but one of strength and confidence for the future. It represents a qualitative strengthening of the CWI and its ability to intervene and influence events in the next period. It is a unification brought about by the capitalist crisis, which has tested all revolutionary tendencies, and the revolutionary winds which are blowing around the world. Amid the crises, splits, and pessimism which is the lot of others on the left in this period. This principled and enthusiastic unification of our forces will be noticed by workers, youth, and revolutionaries around the world searching for a powerful socialist alternative. We invite them all to contact, discuss, and fight with us for the building of a mass world party of socialist revolution. Previous articleThe Fight Against the Right Has Only Begun!